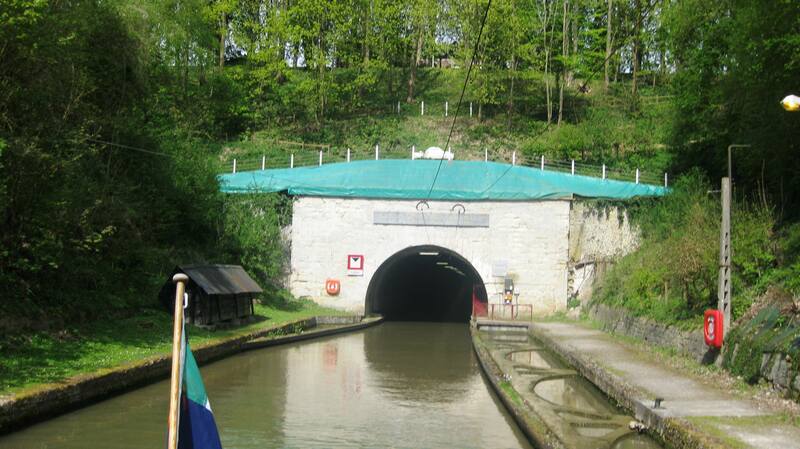 La Grand Souterrain – Long Tunnel on St Quentin Canal – 5.5 hours to travel 5.5 km- I could have swam faster! This is a 5.6 km tunnel through the mountains on the St Quentin Canal. All the boats have to turn off their engines to be roped to the boat in front, and pulled through the tunnel by special chain driven electric tugs. 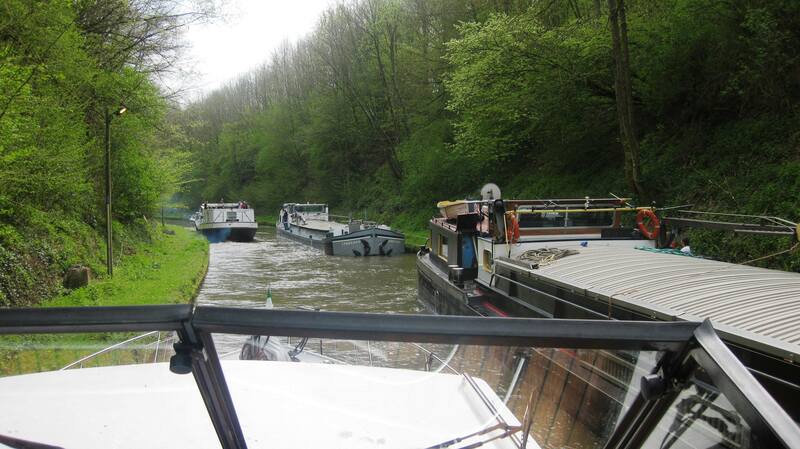 The fully laden barges go first, then the empty ones ,then pleasure boats in order of their size…… with us last. The building of this section of the canal was organised by Napoleon and he personally opened it in 1810. It’s the longest canal tunnel still in use on the French Waterways network. On Saturday morning at 8.15 am we left Vendhuile where we had moored overnight along an old quay wall, to be as close as possible to the starting point. It was very foggy and the South bound tow was leaving at 9.30 am. Tam and Di had given us great advice- told us we needed to make up a tow rope of at least 30 meters length, take down the canopy and radio arch and put towels on the high guard rails to protect them. They warned us that we would most likely be at the end of the tow and that the boat could bang off the tunnel walls if we were not careful. I had spent the night before practising making bowline knots and sheet bend knots to join our mooring ropes together to make a bridle and tow line of 30 meters. Now all prepared and with our hearts in our mouths ,we pulled up behind a large pleasure barge and asked if he would tow us. He agreed to do so and told us that the tow would not start till at least 10.30! Suddenly there was a flurry of activity and the man on the barge in front indicated that we should pass over our tow rope. Off we went and we were pulled into the tunnel. We did not get any photos at this stage as we were too busy concentrating on keeping the tow line taut and the boat off the tunnel walls. The pleasure barge in front of us had his engine on for the first bit and the fumes nearly killed us. He then turned it off and I did the same. As soon as I did, we started to move faster and the tow line was rapidly heading for the stern of the boat in front. I tried managing the tow line by hand and when that did not work I tried towing a bucket and a large bag on ropes in the water behind the boat. Even with the bucket and bag slowing us down, the boat was very difficult to manage. We spent the next two hours trying to keep the boat from running up the back of the boat in front. Still…. 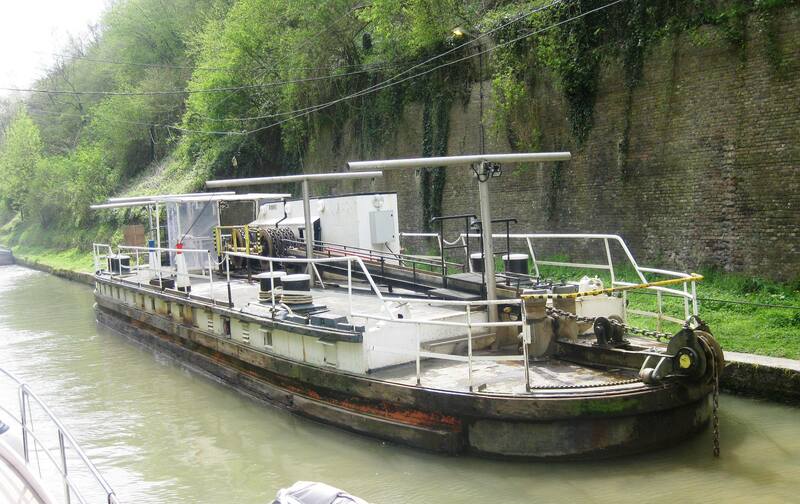 it was a great novelty to see the last tow system on the French waterways and experience part of the history of the canal and the boat did not get a scratch. This entry was posted in Experiences on the Canals, People who have helped us on our way, Travel Tips and tagged La Grand Souterrain, Napoleon, new experience on the waterways, St Quentin Canal, Vendhuile. Bookmark the permalink. 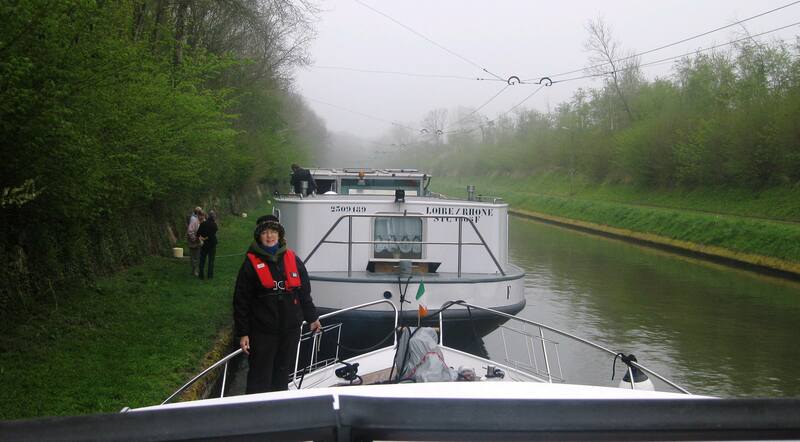 10 Responses to La Grand Souterrain – Long Tunnel on St Quentin Canal – 5.5 hours to travel 5.5 km- I could have swam faster! Looked very misty and grey when you started but brighter when you came out the other side – probably a tense and worrying experience. Sure of your success we drank a toast to you in Lough Erne on Saturday night!! Are you sure you did not drink Lough Erne dry !! Hi adrian and nuala. I am following your blog and enjoying your exploits as i spent many years driving fom dublin through france to spain and encountered many obsticles. Keep the faith and enjoy. United Kingdom Private Royal Dublin Fusiliers 2nd Bn. Date of Death: 06/09/1914 Service No: 7972 II.A.34. I think this is probably the inscription in the cemetery. This was early in the war when the Germans took Cambrai. The main battle of cambrai took place in 1917 and I guess most of the graves refer to that period. Thanks John you saved me some research. I intend looking who J O Brien was. I was meant to find his grave. It was the first grave I saw and after checking there where not that many Irish men buried there. What a difference a week makes. We were the only boat being pulled through – so they provided the rope – and we left promptly at 9.30am and were through in 1 hr 40 mins. Didn’t even have to steer or get buckets out or anything! Time for lunch at the traffic light at the next tunnel and then straight through that and all the locks to St Quentin. Not another boat in sight. so Charles you are on the move again! !